We are so grateful for all the wonderful support that Heathland School in South Harrow have given us over this school year. Their Summer Fair was held on Saturday 6th July and they ran a goat themed stall, filled with fun activities, to raise money in aid of our work with the children in Darfur. 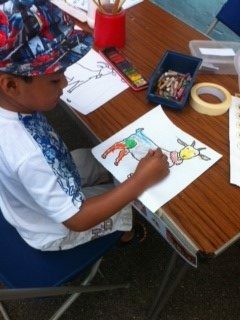 With pin the tail on the goat and colouring rainbow goats, the students had a great time at the stall and raised enough money to buy a goat for a family in Darfur! Thank you to Ms Sabir for arranging and running the stall, as well as the Crazy Hair Day and music concerts that were run by the whole school. What ingenious ideas you have!